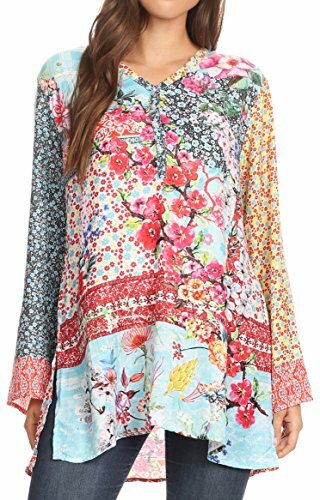 -This lightweight, 100% Polyester top features a beautiful vibrant print, long sleeves and a generous length. Love the material and the flattering fit. This top is perfect for casual wear, versatile! One size regular: Bust 44" (112 cm), Length 32" (81 cm). US 4-16 W, EU 34-46, UK 8-20. One size plus: Bust 50" (127 cm), Length 34" (86 cm). US 8-22 W, EU 38-52, UK 12-26. Shell: Polyester with colorful digital print. Care: Wash cold, iron from reverse, hang dry. Dry clean recommended. Gorgeous and super soft blouse top with embellishing. Silky texture and light as a feather. This striking top features a V-neck with buttons and long sleeves. Perfect for work, casual wear, brunch, going out, events, church, weddings and traveling. Easy and comfortable to wear. Pair this lovely blouse with you favorite skinny pants and heels for an effortless look! Add a belt to accentuate waist and wear it as a mini dress. Hand wash cold, hang dry. Dry cleaning recommended, imported, 100% polyester.